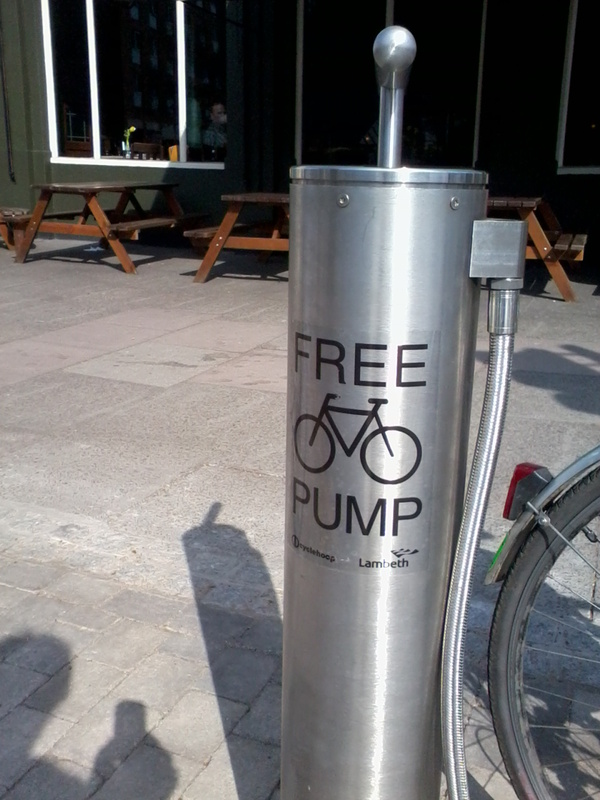 And what better place to top up your tyres than at the first on-street public bike pump in London, recently installed outside the Three Stags pub on Kennington Road. 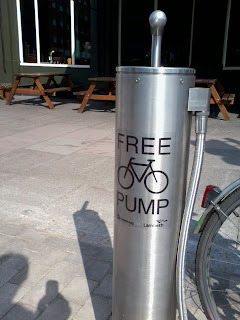 It's designed by Anthony Lau, inventor of the CycleHoop you see on signposts. Just when you thought there might be a chance that the monstrously huge Vauxhall Gyratory might be removed, to make it a pleasant place for thousands of new residents to live in the planned new homes, along comes a document which says it might not be gargantuan enough! After you've read the following, please fill in Lambeth's questionnaire about the draft Vauxhall Supplementary Planning Document (SPD) and demand that motor traffic reduction must be a clearly stated key element. When considered alongside the forecast no development (2026) situation, the strategic highways model developed as part of the transport study and updated to reflect the preferred development scenario indicates that a steady increase in highway traffic volume changes will occur as a residential and employment density increases (Figure 6.4). The key arterial routes running through the OA and connecting to the bridges experience the greatest current and future traffic volumes, with increases exacerbating existing problems at Vauxhall, Chelsea and Lambeth Road Bridges and key junctions within the OA. The Vauxhall gyratory experiences the greatest current and forecast volume of traffic in the OA. With preferred development scenario levels of traffic, highways modelling indicates that the current junction capacity may be inadequate which, if unmitigated, would lead to increased congestion on major routes into the Vauxhall area which itself would lead to re-routing of traffic along parallel routes and local borough roads. The potential impacts that have been identified highlight the need for a restraint based approach to car parking for all land uses. This will help to reduce unnecessary car journeys and encourage the use of more sustainable modes such as public transport, cycling and walking. 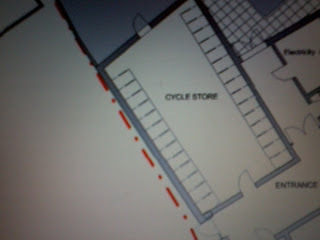 There will also be a need to undertake selective junction improvements, e.g. at Queen’s Circus and at the junction of Battersea Park Road with Queenstown Road. There is also a requirement to look in more detail at the potential impact of traffic generated or attracted to the OA on key routes/junctions outside the OA. This work is to be undertaken by TfL, in conjunction with Lambeth and Wandsworth." (Incidentally, the VNEB OAPF picture of the proposed Thames 'pedestrian and cycling bridge' still suggests the plan is for a bridge to push your bike across). 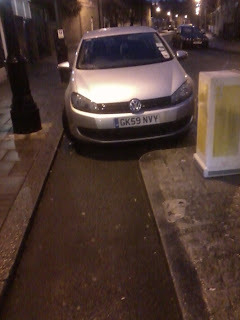 Why didn't we use the cycle path? 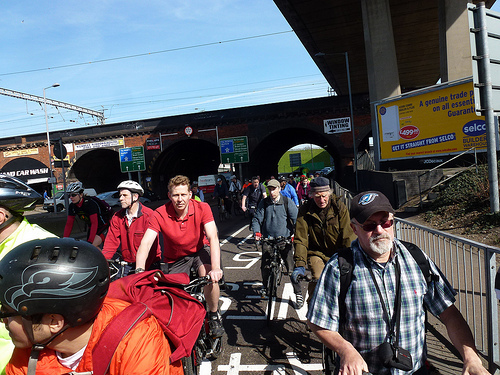 I was well out of my normal territory when, on the request of Barnet Cyclists, I led about 80 cyclists on the Great Divide Ride on Sunday, highlighting the cycle-unfriendly junctions that criss-cross the North Circular Road. 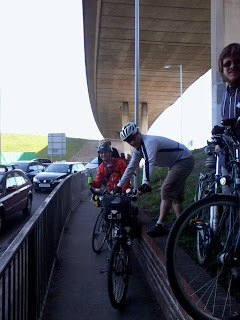 In working our way around the area we also travelled along a little of it at Staples Corner (the base of the M1).This photo by Shaun McDonald shows a few of the riders at this point. 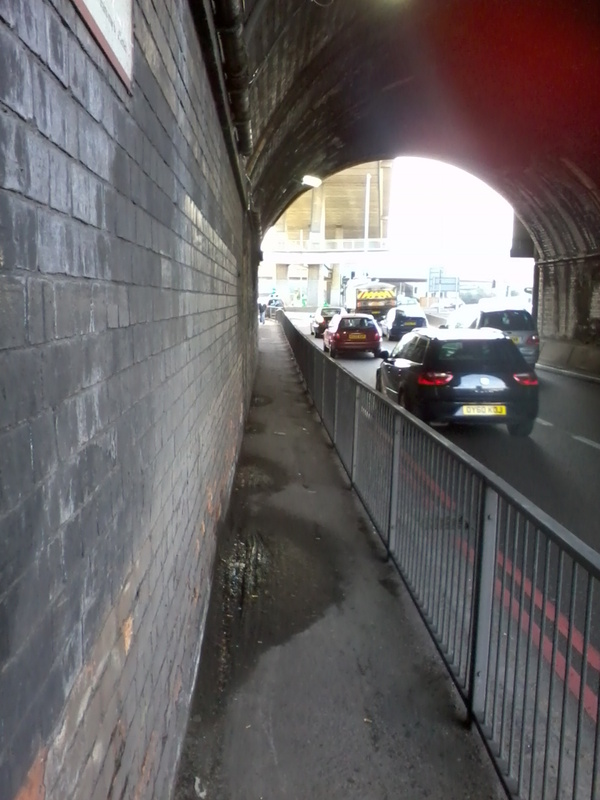 I should point out that, exceptionally for this area, there is a very well hidden attempt at provision for cyclists under the railway arch in the background so one may argue that we needn't have taken the road. The reality is otherwise. I took a few cyclists on the cycle path after the ride as they wanted to return with me to South London. Which would have been bloody funny, or not, with 80 of us. Given the amount of money the North Circular Road and related major roads at this point (including the flyover you can see) must have cost it boggles the mind that the provision for cyclists and pedestrians was so lame. It's time for this sad situation to be rectified, but which prospective Mayor will be the one to tackle such historic horrors? Time to sign up to http://www.londonersonbikes.org.uk/ and as the polling date nears check which candidate to vote for. 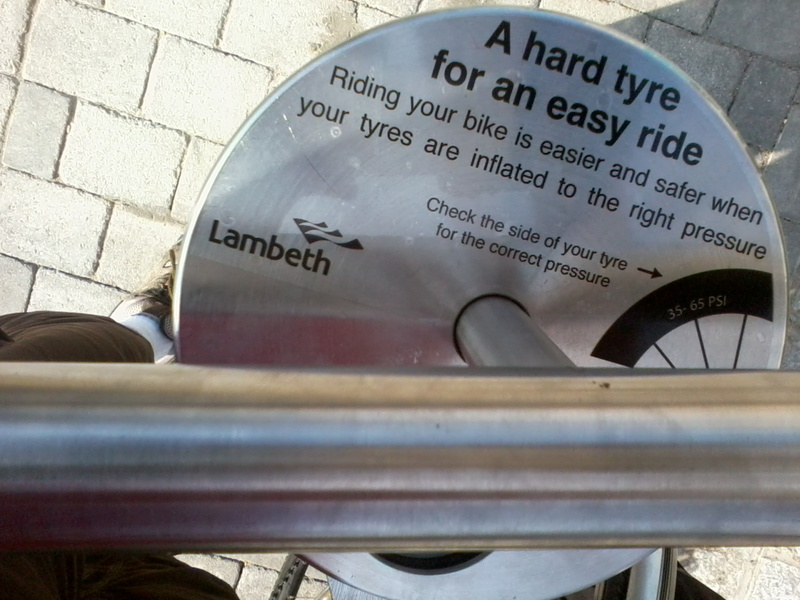 Lambeth Cyclists have for a long time now run a course in cycle maintenance over five Tuesday evenings. It's affordable and led by Simon Bendel from Brixton Cycles who knows his stuff and is a friendly and experienced tutor. The next course starts on April 10th and I strongly recommend it to anyone wanting to undertake basic maintenance on their bike. Details are on Lambeth Cyclists website. 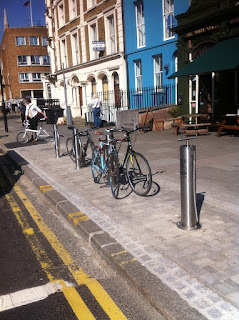 Bicycles are already allowed into Cardigan Street from Kennington Lane, but parking spaces immediately in front of the access point make things dangerous and difficult for cyclists. The Council proposes to remove two parking bays so that cyclists can continue through. The Council proposes to allow two-way cycling on Tyers Street. Infrastructure changes will be minimal, involving small changes to signs and road markings. 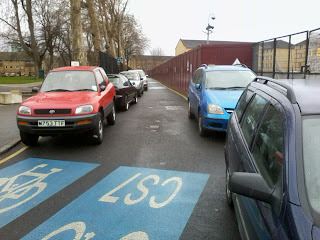 Motor vehicles will still only be able to travel one way. The Council proposes to allow two-way cycling on Sancroft Street. Infrastructure changes will be minimal, involving small changes to signs and road markings. Motor vehicles will still only be able to travel one way. 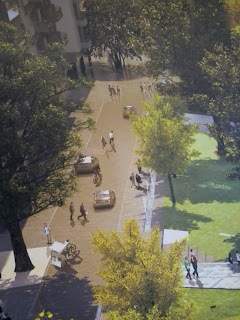 It is also proposed to remove two parking bays at the junction with Vauxhall Street to improve visibility and safety. If budgets permit, the section of Sancroft Street between Cardigan Street and Kennington Road will be resurfaced. The Council proposes to allow two-way cycling on Wincott Street. Infrastructure changes will be minimal, involving small changes to signs and road markings. Motor vehicles will still only be able to travel one way. It also proposes to remove a parking bay at the corner of Wincott Street and Kempsford Road and replace it with a built-out kerb to improve visibility for cyclists and pedestrians. 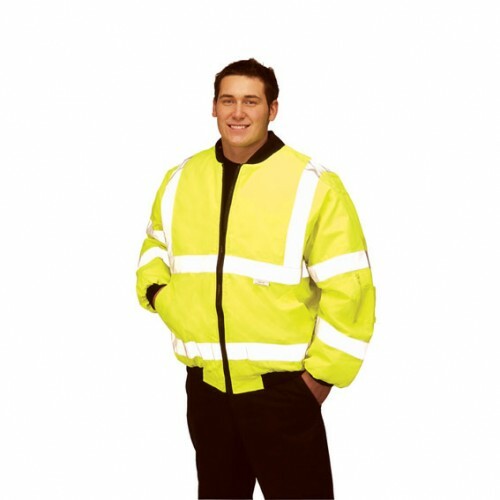 I spend a great deal of my time on streets where some, and at times the majority, of the people are wearing Hi-Vis clothing. Welcome to the motorcentric world where the Careless controllers of the heavy, fast vehicles expect the Carless to stick out like a sore thumb. 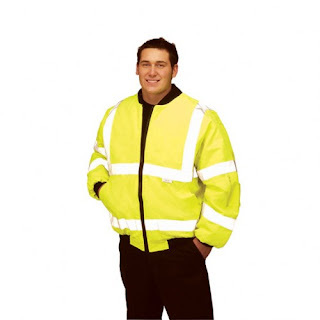 I think the photo above shows rather well how the Highway Code authors would like school uniform coats to look. Outdoor Coat: Plain black – decoration and badges are not allowed. So, that's clear then. The schools want their pupils to look stylish and smart in dark colours, rather than walk around dressed like traffic cones. An application (12/00054/FUL) has been made by Dolphin Square Foundation for 130 - 138 Newington Butts (just before Cycling Superhighway 7 northbound branches onto Courtyard Row to avoid the E&C roundabout). “the demolition and redevelopment of the site comprising a part five storey, part six storey building and basement for the purpose of 76 residential units comprising 41 x 1-bed, 29 x 2-bed, 4 x 3-bed and 2 x 4-bed units, together with 500 sq m GEA of retail (Class A1) use." Given the excellent public transport they intend to provide no car parking spaces, beyond disabled parking, and one cycle parking space per residential unit in line with the minimum standards required by Lambeth. One may quibble about whether this is enough. 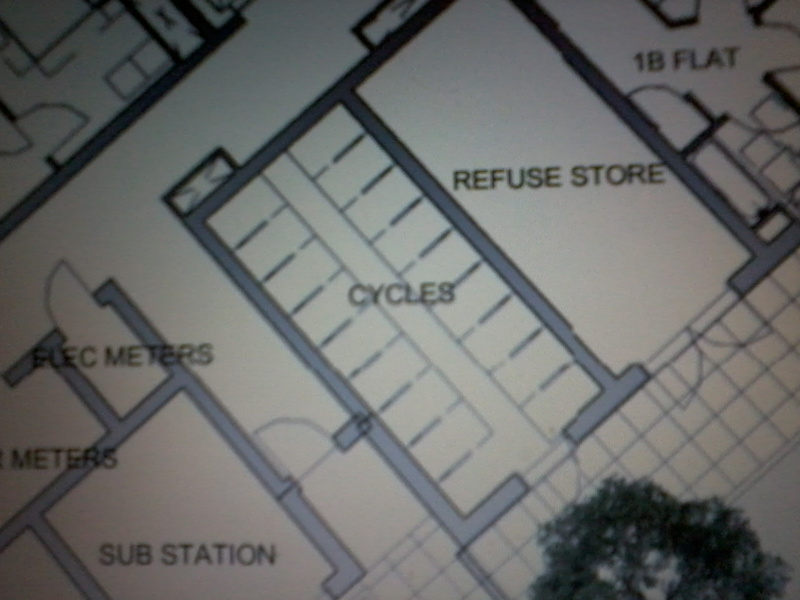 Encouragingly the cycle parking is on the ground floor, rather than down a flight of stairs in the basement as I've seen in other planning applications. 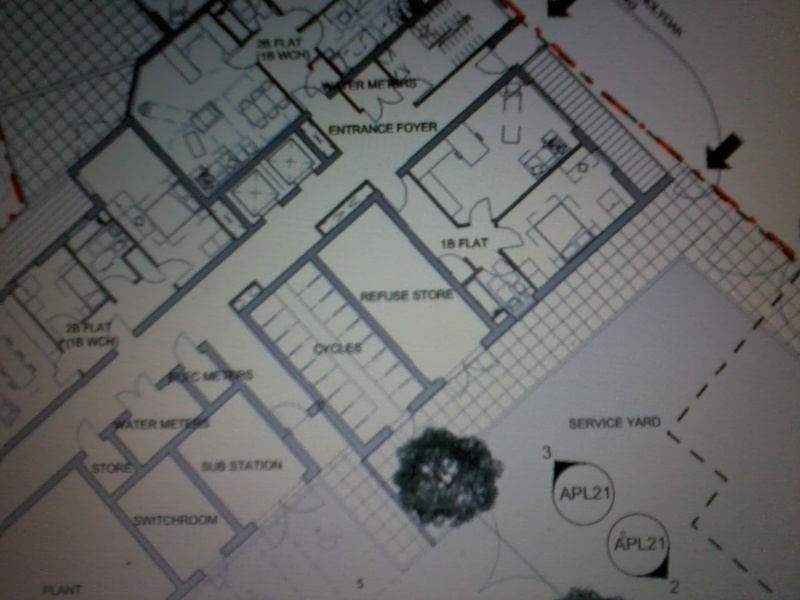 However the photo above shows one of the planned rooms. 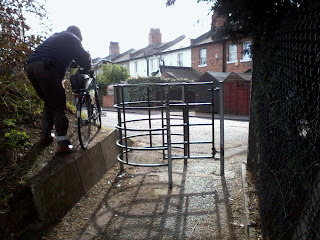 There may be enough room for the bikes but it's going to be a battle to get them in or out. There's a narrow central aisle with a single door exit (note the bin store has a double door) which opens onto a tree. 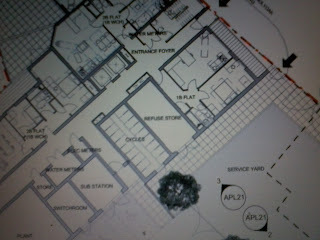 Below shows a bit of the wider plan. It appears that you leave your flat, go out of the front door onto the street then enter the building by another door to go through the narrow door to the narrow aisle to wrestle your bike out of its stand while hoping no-one else is trying to do likewise. 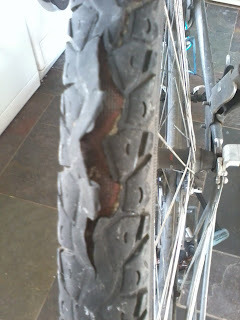 It's not really making cycling the quick and easy transport option. The plans also show no intent to provide Sheffield Stands outside the flats for short-stay use by visitors dropping in to pick something up. A similar situation has resulted at the nearby Dugard Way development I commented on recently. The second bicycle store, while still let down by the single door to enter/exit that discourages child trailer use, for example, thankfully has more ample proportions. The final concerns I raised, using the measly 500 characters that Lambeth Planning allocate for on-line comments on planning applications, relate to the food store planned on Newington Butts. I asked for more pavement cycle stands than planned, given it's on a cycling superhighway, and sought reassurance that the store would not be restocked by lorries parking in the bus lane-come-cyclesuperhighway. Our local recycling and reuse centre used to be approachable on quiet back streets and just 0.7 miles away, off the Walworth Road. It's just been closed by Southwark Council and replaced with a shiny new one 2.7 miles away off the deeply unpleasant A2 just past Rotherhithe Road. When I got there today I was told off for coming in on my bike with its trailer laden with ancient paint, scrap metal and dead tyres. Apparently I'd ignored the sign which said 'No Bicycles', though when I checked on my way out there wasn't one. Anyway I guess I won't be going back there again. 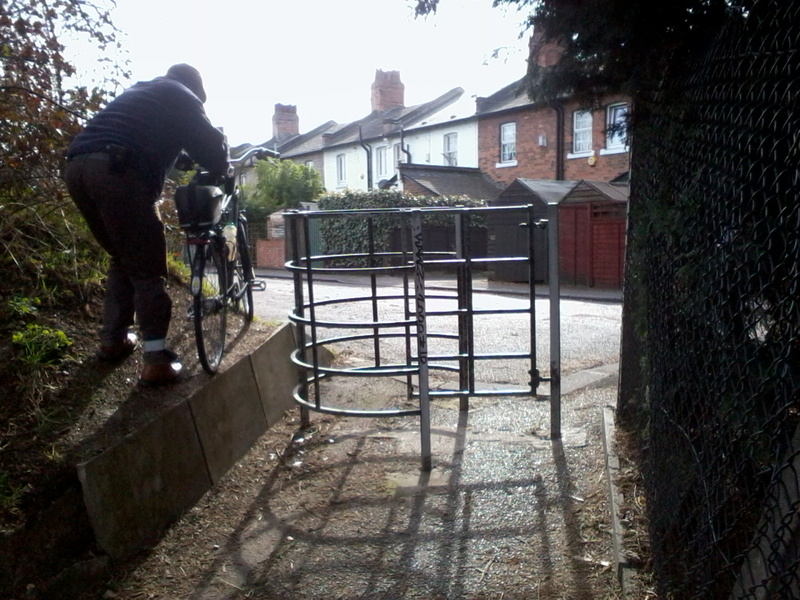 Unfortunately the site is not suitable for cyclists and pedestrians. If you wish to drop off recyclables or household waste by bicycle or on foot, you may do so at Smugglers Way SW18. Smugglers Way is near Wandsworth Town Station, 4.8 miles away. So what used to be a quick mile and a half round trip to the local tip has now become a ten mile expedition. I know what you're going to suggest: rather than using Southwark's or Wandsworth's centres (which Lambeth residents, at least those who drive a car, are entitled to) I could use Lambeth's in Vale Street, SE27. Unfortunately that's 5.7 miles away, the best part of a 12 mile round trip. Given that a large and increasing number of central London residents don't own a car I think there's a flaw in the system. Churchyard Row and other local streets get totally parked up by the motor vehicles of those attending the Metropolitan Tabernacle at Elephant & Castle on Sundays, despite the incredibly good public transport service to the Tabernacle and the provision of a cycling superhighway (above only as it appears on Sundays). The Metropolitan Tabernacle doesn't mention cycling on its website. 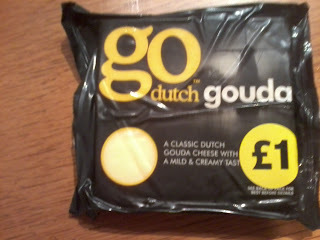 The London Cycling Campaign is running a 'Go Dutch' campaign running up to the Mayoral elections. It's good to see a cheese maker is spreading the word. If you haven't yet signed the LCC petition please do so now. There are frequent pedestrian and cyclist protests on the Euston Road by Kings Cross Station, pushing TfL to make the area less dominated by motor traffic. This morning, during the rush-hour, there was a counter-strike with 'Crossing not in use' signs placed over the pedestrian signal push button controls. The pedestrians realised the light phases were working perfectly well and ignored the attempts to get them to drive instead of walking. Above is a route in Barnet that was designed by the kind of absolute bastards who try to force people with wheelchairs, push-chairs or bicycles to use their cars instead of a convenient path. Please join the fight back by taking part in the Great Divide Ride on Sunday 25th March. Finally, a word of advice from personal experience. Before taking part in a ride on major roads back and forth over the North Circular Road check your tyres aren't falling to pieces. Gulp! 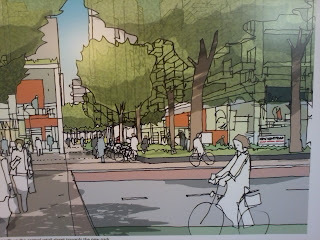 Oh no, I hear you say, not another bloody consultation event on the future of Vauxhall. I think it's more important than ever to get along to it and provide feedback, partly because loads of skyscraper developments are already going to planning committee and partly because I think that Lambeth Council might actually be working hard to get to a sensible proposal for their residents (including the many thousand anticipated to dwell in the Vauxhall to Waterloo mini-Manhattan area).. Here are the details so please get along and check that a gastric band will be applied to needless motor vehicle journeys in favour of more sustainable means of transport and a better urban realm for those living in the skyscrapers adjacent to the current gyratory. 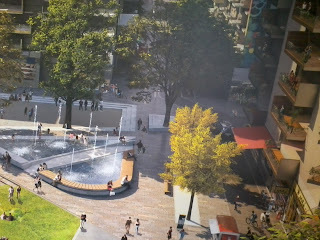 "Vauxhall and Albert Embankment are part of an area earmarked for major redevelopment. What should the Vauxhall area look like in the future? Lambeth Council are preparing a supplementary planning document (SPD) for the Vauxhall and Albert Embankment area that will set out a vision for the future and provide a guide as to what kind of development will be acceptable. We’d like you to help us to shape this document. Come along to the event below, meet the urban designers and council officers involved and have your say. Unit 13A, St George Wharf, Vauxhall SW8 2LL"
I also hope that the outcomes are published more speedily than the master document for the area, the "Vauxhall Nine Elms Battersea Opportunity Area Planning Framework" or VNEB OAPF for short which I believe is still in draft format in March 2012 despite an intention to publish it during 2011 following public consultation ending March 25th 2011 and previously in November 2009. Does it really take a full year to absorb what was said in response to your draft, make appropriate changes and publish it? Late last year the eastern Cycle By-Pass to avoid the dangerous Elephant & Castle roundabout was relocated to permit work to start on redeveloping the Heygate Estate. I'm pleased to report that, just a little over two months later, work has started to alter the signage so it no longer directs you to cross the noisy, polluted New Kent Road (above, as imagined by LendLease to look in the distant future) where you now can't. The pavement that leads to the newly installed Pelican pedestrian-only crossing has been marked as shared space allowing cyclists to ride right up to the Pelican Crossing where they have to dismount and walk across the New Kent Road before remounting to ride on the shared pavement the other side. Why then did TfL not install a Toucan crossing instead allowing cyclists to ride across the New Kent Road on this Cycle By-Pass to avoid the dangerous Elephant & Castle roundabout? "Transport for London (TfL) undertook a modelling assessment on the crossing and found that unfortunately, a Toucan could not be provided here as it would result in significant delays to the traffic flow. 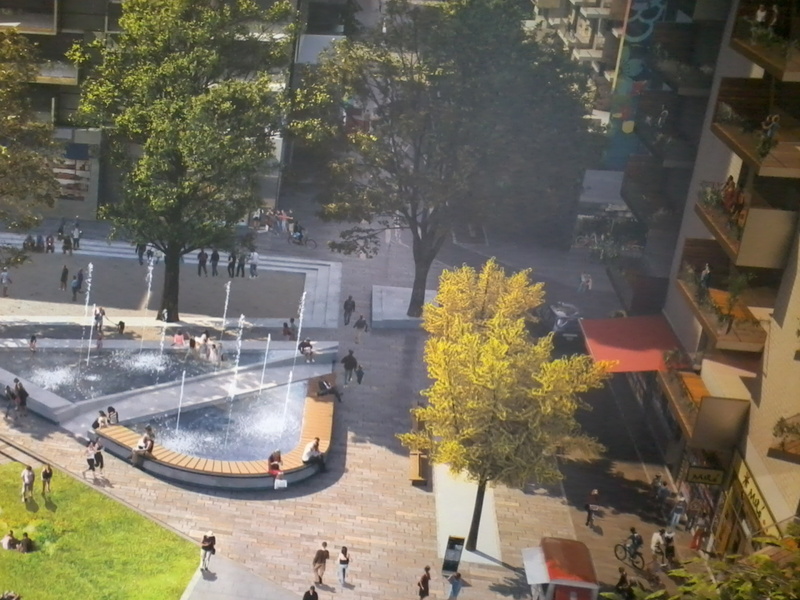 The design drawing which indicated that this crossing would be a Toucan was provided by the developer of 50 New Kent Road at the initial design stage." What TfL fail to explain is why, if they deemed a Toucan crossing was not feasible on a Cycle By-Pass to avoid the dangerous Elephant & Castle roundabout, their consultation included one. Maybe they thought they'd get strong objections if they showed a Pelican crossing on a major cycle route and hoped that if they showed a Toucan on the plans no-one would notice when the Pelican was slipped in instead? 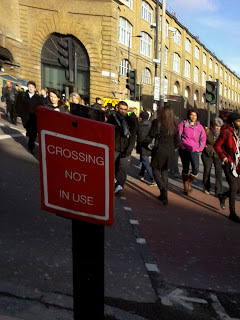 Cyclists will however be reassured to know that this crossing relocation is only temporary. The Pelican will be there for a mere FOUR F***ING YEARS to enable the new development at 50 New Kent Road to be constructed, part of the huge Heygate Estate area redevelopment. 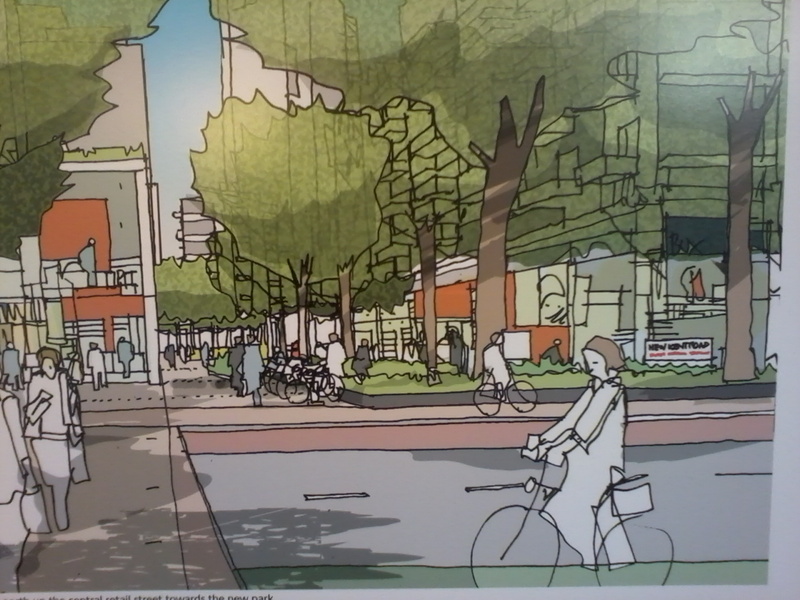 LendLease, the developers of the Heygate, had an exhibition of their plans last week. They were adamant that they did not want a Cycling Superhighway running through their site so it look as though the pressure is on TfL to make the E&C roundabout totally sweet for cyclists to use. I'd suggest they have a look at my doodle here. 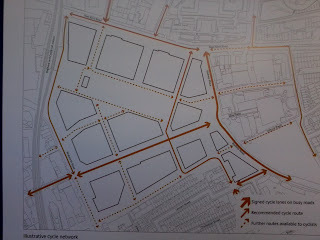 While LendLease don't want a Cycling Superhighway their plans show a reassuring intent to enable cyclists to ride around their patch and to restrain motor vehicle use. Below is a plan showing proposed cycle routes in red (sadly not yet showing one through the railway arch to the west and the new swimming pool) and some impressions of how the spaces might look. In the last throws of the current Mayoralty, there's a chance to raise concerns with the Deputy Mayor of London this Thursday 8th March at 18:30 at Crossway Church on New Kent Road (adjacent to the junction with Rodney Place). Whilst organised by the Spanish/Portuguese speakers alliance, they would like to invite and encourage everybody with an interest in the area to attend and to quiz Richard Barnes on any aspect of Mayoral policy that affects the Elephant - from housing to transport to S106 funds and beyond!